Monterey leopard has always been on an A-list for many women golfers. There is that mysterious charisma that leopard prints bring to many of us and it makes us feel confident on the golf course. 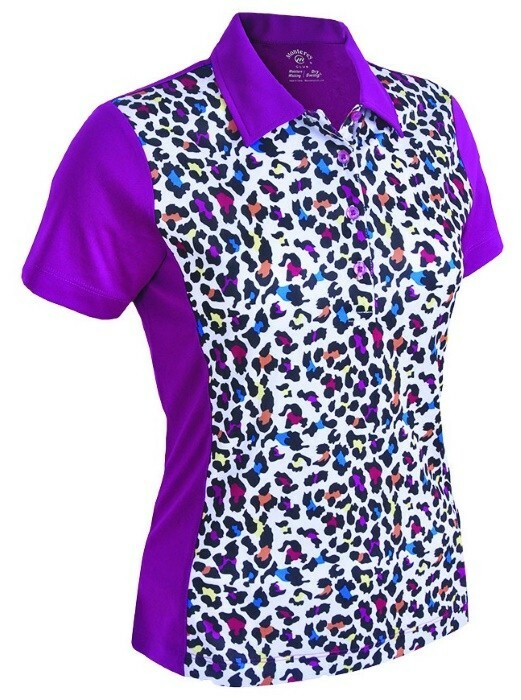 This year another selection of leopard print will rock your golf experience. 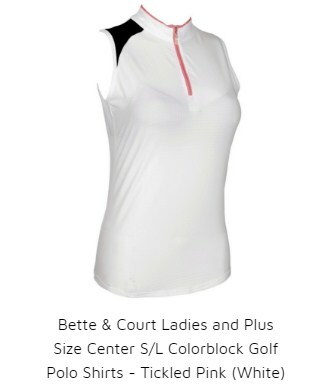 I know a lot of us would want to look fashionable and sporty on the golf course. Fortunately, Monterey Club has three new beautiful polo shirts that also fit missy to plus size women golfers. 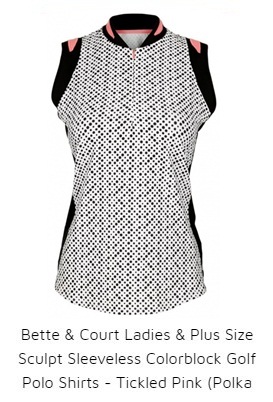 The Monterey Club is known for their active golf pieces and plus size selections. All of their shirts are available in S, M, L, XL and XXL. They have dry swing and moisture-wicking technology that makes you feel cool and cling-free on the course. The Monterey Leopard Short Sleeve Polo Shirt would be a great option for a fine weather day. 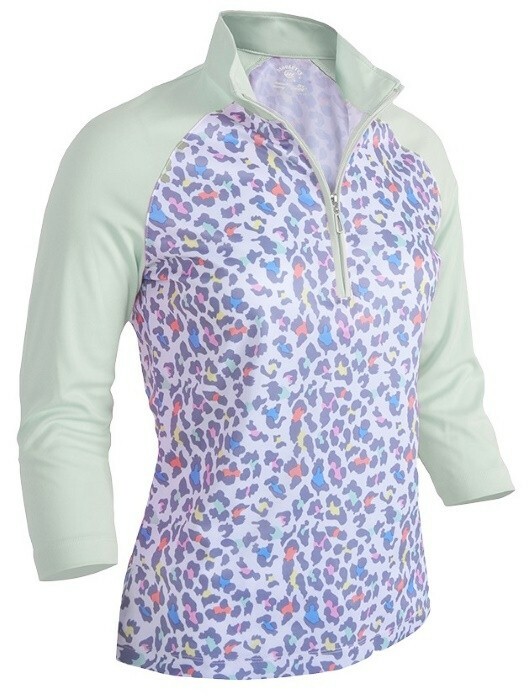 It features a colorblock design and vibrant leopard prints on front. The variation in color and princess seam provides a tailored fit that closely follows your shape. It is made of 97% Polyester, 3% Spandex and keeping you dry and comfy in every swing. Available colors include Mulberry, Black, Fairest Jade and Rose Quarts. The Monterey Leopard Fairest Jade Three-Fourth Sleeve Polo Shirt is perfect for those who are aiming for a lighter shade. 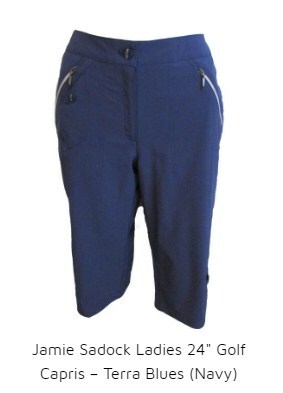 Its faded effect makes it a great fit for light color golf shorts or skorts. You can use it either on summer or winter because of its highly versatile design. Made of 97% Polyester and 3% Spandex, this shirt will keep you dry and cool all day long. You can zip the silver placket all the way up to keep your neck warm or just hang it low to allow some air. Also available in colors Mulberry, Black, Fairest Jade and Rose Quarts. A fresh incarnation of your favorite Monterey Leopard is also available in sleeveless. Take the rose quartz color for a more feminine look. This shirt is also made of 97% Polyester and 3% Spandex making it very breathable especially when the temperature is high. The silver placket and mock collar design adds increased ventilation while the colorblock feature adds a splash of color contrast to its overall appeal. Other colors available are Mulberry, Black and Fairest Jade. The Monterey Club’s new Leopard Polo Shirts Collection is incredibly cool not only for the print-worshippers but also for those who are yet to buy their first leopard golf pieces. 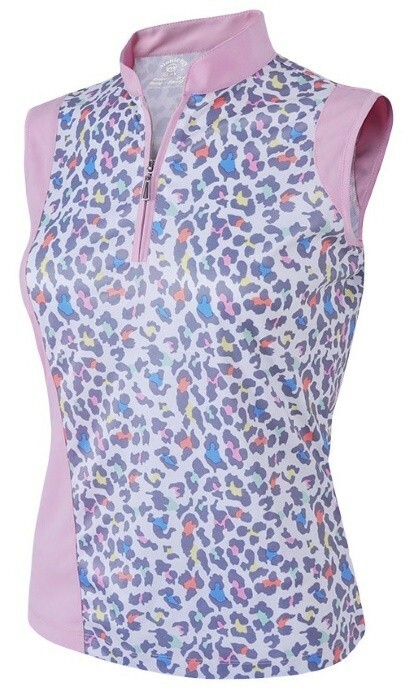 Now, reward yourself with some invigorating leopard golf pieces this February with Monterey Club’s newest selections. Better yet, pick your best pick before they sell out. You don’t need to capture your Odysseus to have someone to appreciate you. 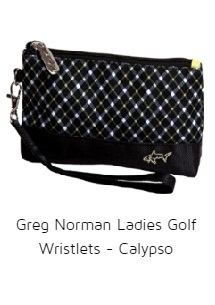 With this Greg Norman Calypso collection, you can feel that you’re an empowered nymph of the golf course that can conquer the game with your skills and style. The Greg Norman Calypso apparel will soon be available in Spring 2017 while the Greg Norman Calypso golf accessories collection is now within your reach. Both collections are in the refreshing colour of Green matched with Black and plaid. Golf bags require lots of space and functionality and Greg Norman items have that! They are stylish, too! This Greg Norman Ladies 14-way Golf Cart Bag has full length dividers, lots of pockets (zip off ball pocket where you can put your logo, seven easy access pockets, thermal-lined cooler pocket) easy lift handle system, rainhood cover, putter well and umbrella sleeve. 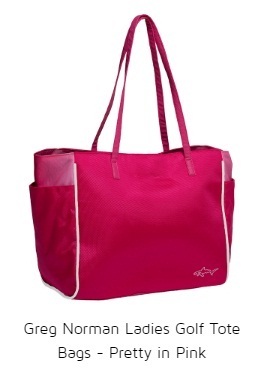 For everything personal, you can entrust it here in this Greg Norman Ladies Golf Tote Bag. With the dimensions 13” x 11.75” x 6.6”, it has two outside side pocket for easy access, PU handle, piping and bottom, inside zipper pocket. 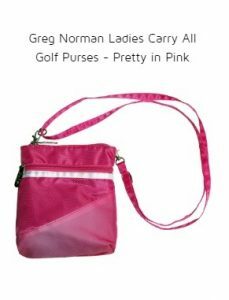 While the valuables that you want easy access to can be stored in this Greg Norman Carry All Golf Purse. You can easily clip it onto the golf bag and then converts to cross body bag. 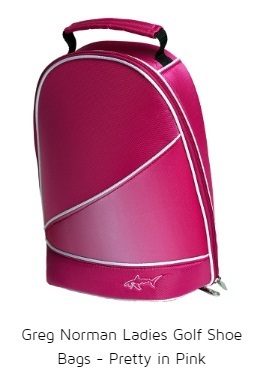 It has a 50” adjustable and detachable strap, two front zippers and inside pocket. For the essentials like cash, cards, keys, etc. 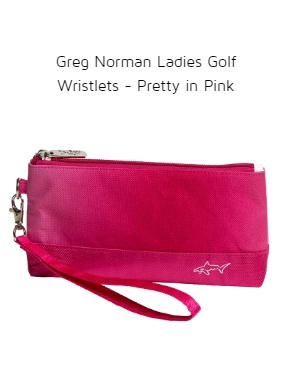 that you can’t afford to lose, here’s an 8” x 4” Greg Norman Ladies Golf Wristlets. Wear it on your wrist or just hold it when you unclip its removable strap. Treat your golf shoes/sandals in style! 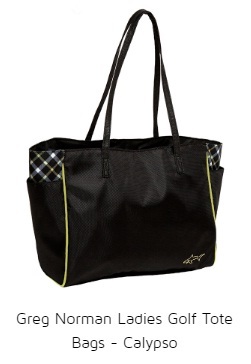 Keep them clean and organized inside this Greg Norman Ladies Golf Shoe Bag. 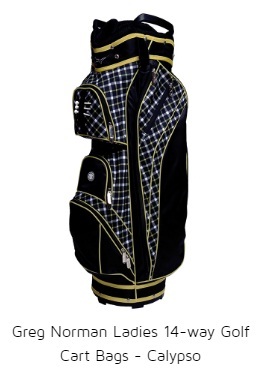 Made of 100% nylon and dimensions of 8.5” x 3” x 15”, this golf shoe bag has a top padded handle and dual zipper design for easy shoe access. 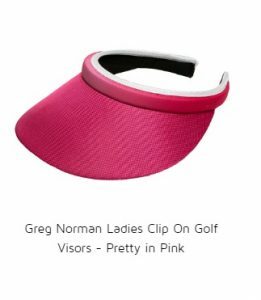 How lovely it is to see matching golf accessories like these Greg Norman Ladies Clip On Golf Visors and a Greg Norman Ladies Golf Gloves. You get that instant pro golfer look! 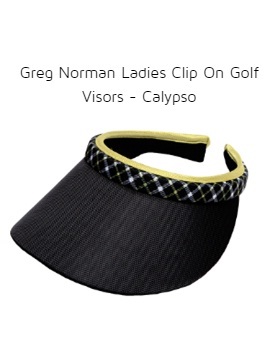 This Greg Norman Ladies Clip On Golf Visor has a wide Black brim for maximum sun protection, moisture wicking terry headband for comfort, UV 50 and made of 100% polyester. 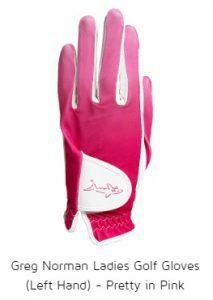 While this Greg Norman Ladies Golf Glove has Stretch lycra, cabretta leather palm and UV 50 sun protection. Available in sizes Small to XL for your left hand. With your golf skills and cool weather, you can reach the final hole with no sweat. 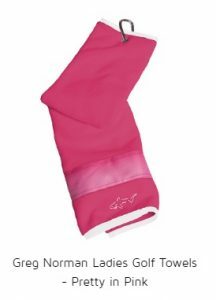 But in case you have, there’s this Greg Norman Ladies Golf Towels – Calypso to keep you cool and dry. This is a micro-fiber terry cloth tri-fold sport towel with dimensions of 16” x 5” and a carabiner clasp. 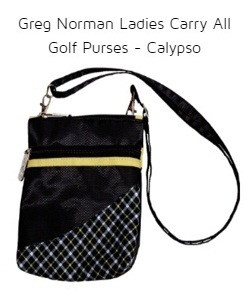 You love this Greg Norman Calypso golf accessories collection, right? You can look forward to Spring 2017 to get hold of the equally stunning Greg Norman Calypso golf apparel collection! Who’s excited for that?! 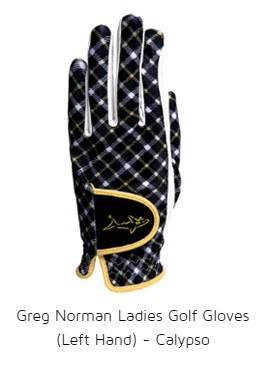 While waiting for spring, you can browse here for more matching Greg Norman golf apparel and golf accessories collection. And if you’re within the area, also do visit Lori’s Golf Shoppe in Calabash, NC. EP Pro Sitting Pretty Collection features plus size golf pieces that deliver form-flattering and tummy-tucking slimness. The collection includes lovely golf shirts, pants, shorts, visors, socks and sweaters. Every piece is designed around girly colors, plush designs and charming details. Some items come in outfits, which means you can take two pieces of the collection with just one click of your mouse. This collection is even better because it comes in Plus Sizes also. Sizes range from XS-XXl, 1X and 2-22 so there is sure to be something for everyone’s wardrobe. 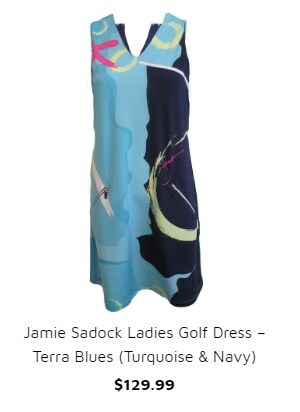 It is easy to get inspired to play on the course while wearing any of this collection. 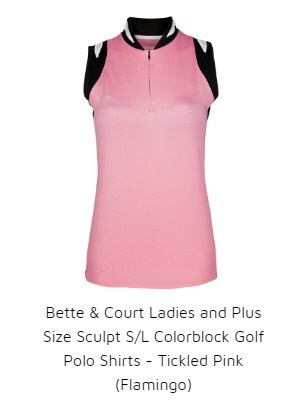 You can go as feminine as wearing this set of blush pink golf apparel. 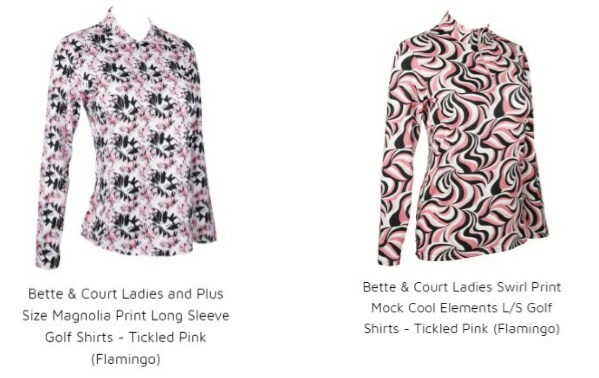 The pair includes a lovely mandarin collar polo shirt and a floral trellis print pull-on golf skort, with a faux angled wrap detail. The skort also looks great with the four-placket, plain tulip pink polo shirt. You can go either way and still look confidently athletic and beautiful on the course. If the weather is cold, you can go for a comfortable set that is not too warm nor too cold like the EP Pro Sitting Pretty Sweater and Shorts. The shirt’s exploded trellis pattern absolutely looks good over the fern green grid gingham print short. You will love the shirt’s fine gauge cotton, which is very smooth to the skin. The short also features 13” tour tech bi stretch rayon, compression mesh inside the panel, and eyelet hem detail. 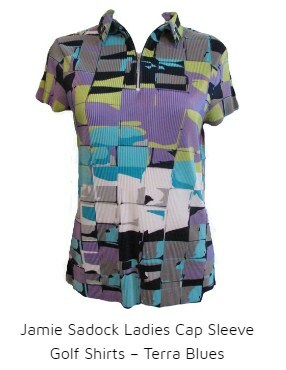 Another favorite is the EP Pro Ladies Sitting Pretty Fern Polo Shirt & Blushing Multi Color Skort. The short sleeve polo includes a tour-tech micro poly pique and contrast stitching. Its floral placket design perfectly blends with the floral print skort. You can tuck in the shirt to flaunt the skort’s ribbon waist detail. Aside from the shirt’s dainty cap sleeve, it has a detailed piping and color block design of blush pink and fern green, which also looks good on the floral print skort. Just a tip when you take this set, you should also take the white Cap Sleeve White Golf Shirt. 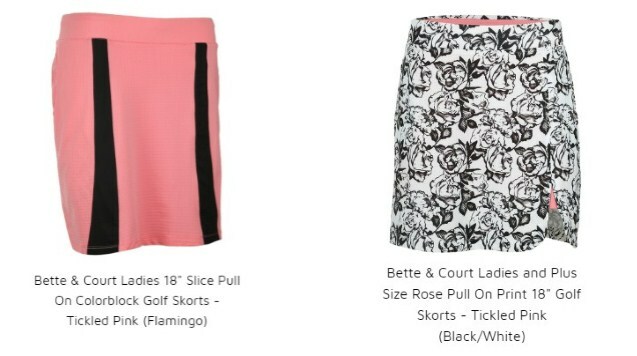 As ladies, we always want to have an alternative match for our golf skorts. In case you don’t feel like wearing a dark top, you can wear a plain white polo shirt. As we all know, wearing the best choice of golf apparel is not just a fashion statement. It ensures us ultimate comfort while we are on the course. All golf pieces from the EP Pro Sitting Pretty Collection are made from high-quality materials. With a bi-stretch comfort and technology, this collection keeps plus size women in shape and dare we say – fashionable and confident. 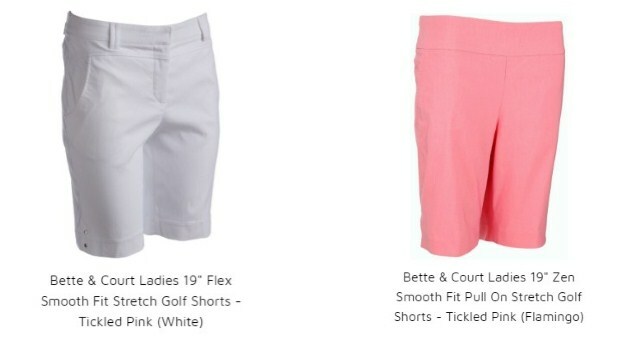 All of the EP Pro Sitting Pretty Ladies Golf Skorts come with side and back pockets which can be used as a storage for golf balls, ball markers, scorecards, and other small items. The EP Pro Sitting Pretty Collection is unquestionably a wardrobe must-have. So which of the featured EP Pro Sitting Pretty outfits are your favorite? Or better yet, start shopping for your chosen golf apparel and ace your next golf game. Admit it, cheetah prints are one of the oldest fashion styles in the history of golf but they always have won the heart of women. So if you want lighter shades for this season, you will love the Glove It Uptown Cheetah Collection. The collection presents a lovely selection of ladies gloves, 14-way golf cart bags, wristlets, shoe bags, and coil visors. Although accessories are not required for every golf game, a complete set will keep you more comfortable on the green. Whether you like to walk, ride or want to be stylish on the course the Glove It 14-way Uptown Cheetah Golf Bag can be your best friend. It helps you transport clubs and other accessories with ease through its 7 easy access dividers, putter well, and easy life handle system. A few practical accessories can also help you carry on a delightful golf game experience. So if you are going to play under the sun, you can wear the Glove It Uptown Cheetah Coil Visor to shield yourself from the harmful sunrays. This visor includes an adjustable coil, wide brim for sun protection and UV50 for sun protection. 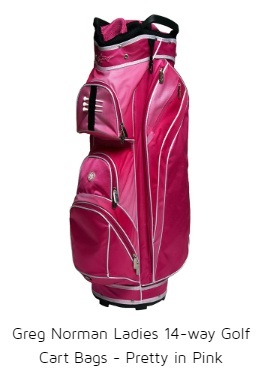 Rain or shine, you will need the beautiful Glove It Ladies Uptown Cheetah Golf Shoe Bag. It keeps your shoes in place before and after the game. 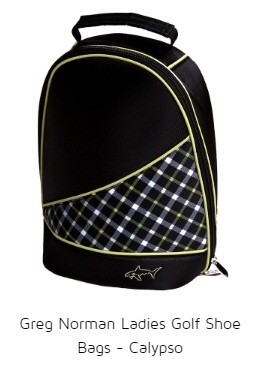 It has a full-length zipper, mesh ventilation, and an easy-grip top carrying handle. 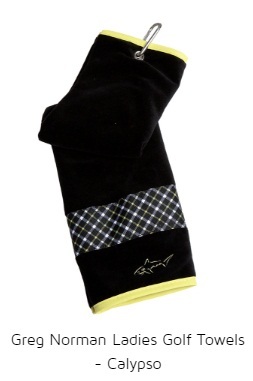 When your hand gets sweaty, Glove It also comes to the rescue with an Uptown Cheetah Golf Glove. It is made from Cabretta leather palm and stretch Lycra back which helps improve your grip and prevent the club from turning in your hand. The last but not the least thing you want to do is make sure your personal belongings are in tack. Thanks to Glove It Uptown Cheetah Wristlet, there is an amazing way to carry all of your tiny items on the golf course without leaving them unorganized. The lovely Glove It Uptown Cheetah Wristlet has an 8” x 4” compartment which is perfect for carrying essentials such as cash, keys, cards, sun-screens and make-ups. With a removable wristlet strap, you can just grab it and go, or keep it inside your golf bag. Whether you are out to practice or play a real game, it is always a good idea to make sure you are ready. Choose your favorite accessory or add the complete Glove It Uptown Cheetah Collection to your wardrobe. Each item would also make a great gift for your love ones who play golf.